GCK facilitates your ability to search multiple web sites for matches with DNA sequences, protein sequences or key words through its database searching tool. 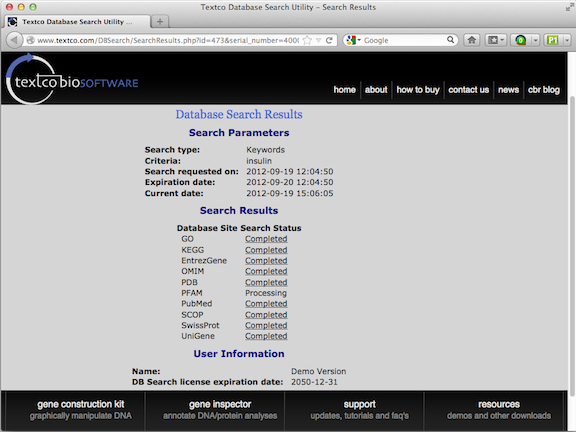 To access the DB search, choose Tools > Database Search…. GCK will check with the database server that Textco BioSoftware has set up and will then show you a list of available databases that can be searched (Figure 2.86). Choose Keyword Search from the popup menu. This will show you a list of the currently available web sites that can be searched for key words by GCK. As new sites become available and others go offline, Textco BioSoftware will update the database server to reflect those changes. You can choose which databases to search by using the checkboxes. Leave them all selected in this case. Type in the keyword “insulin” and press the Search button. You will be taken to your web browser to see the result. You should see something resembling Figure 2.87. You may seem something different as databases are added or removed from the search. This shows all of the searches that have been initiated. As each search completes, its status will change from Processing to Completed . If you click on the Completed link you can see the results of your search displayed in your web browser. 4. Now lets do a protein search. Open the file hsp70.gcc and select the protein sequence, which is the arrow below the construct – do this by clicking on the arrow once. If you view this as a sequence (Construct > Display > Display Sequence) you will see that it is a single letter amino acid representation of the hsp70 protein. Now copy the selection to the clipboard (Edit > Copy) and then choose Tools > Database Search. Click in the Search for: field, and choose Edit > Paste to paste in the amino acid codes for the selected protein. 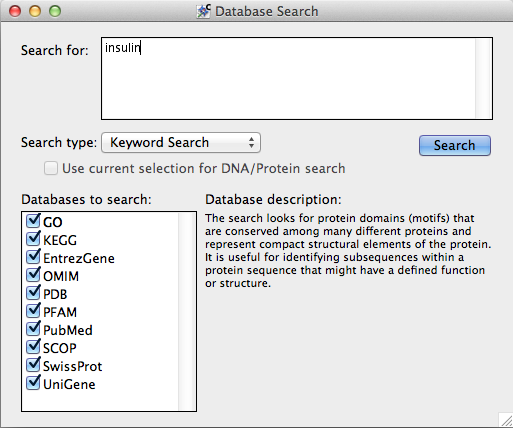 Toggle the Search Type dropdown to perform a Protein Search, and check off the last item in the Databases to search list, the KOG database. Now press the Search button to see the results. You also have the ability to launch this type of database search for DNA and/or Protein sequences based upon the selected segment in your GCK construct. This makes it very easy to find out more information about whatever sequence you might be examining. This entry was posted in gene construction kit tutorials and tagged Biological Database Search, Gene Construction Kit, Gene Construction Kit Tutorials, GO, KEGG, OMIM, PDB, PubMed, SCOP, SwisProt, Tutorials. Bookmark the permalink. Post a comment or leave a trackback: Trackback URL.